A little flashback art project this week with the girls. 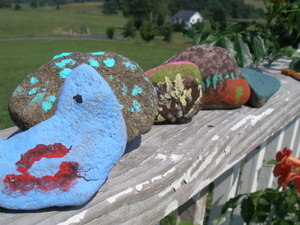 I remember painting rocks when we were younger, and even remember a few handpainted rock doorstops scattered around our house. We finally got around to scrubbing the rocks off and painting them early this week. It’s funny doing art projects with children. Oftentimes, I go into them with big, glorious plans for how the finished project should look. And what is usually being dreamed up in my mind is something far too complicated and controlled for a carefree two and four-year old. This project reminded me that it’s just fun to create. to paint. to doodle. to have no plan. no required outcome. no step by step instructions. 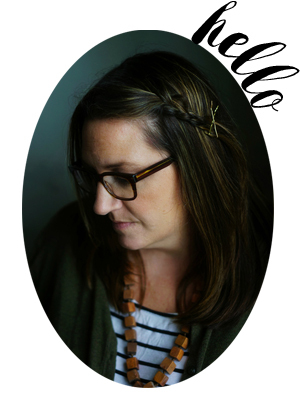 the process–from wading into a cold stream to pick the perfect rocks, to swirling colors of paint in a dish and realizing they just turn grey on the brush, to arranging the rocks in a row on the porch–is far more important than the finished product. And you know what else is important? Putting on a pair of pink stripey socks, your sister’s too big riding boots, and clicking around the house all morning long. Does she have them on the wrong feet? That is the cutest picture! I love the rocks! My kids painted me a rock for mother’s day probably 10 years ago and it is still in one of my flower beds. So sweet! 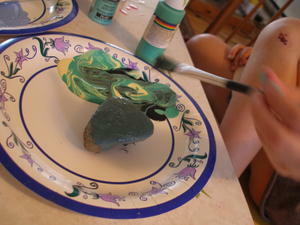 Ah, rock painting brings back some good ol’ memories. And look at those chubilicious thighs! SO cute! oh – i know what you mean about having grand plans for projects with your kids. sometimes you just have to throw your hands up in the air and let them go at it. I do like the rock painting idea …for me and for them. Those painted rocks are pretty fab, too! 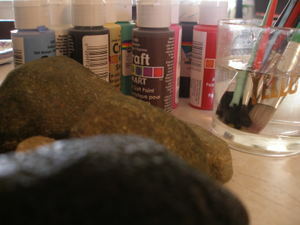 have you ever tried heating the rocks and then coloring them with crayons so they get all waxy? i think i saw that in family fun, but have yet to try it. rocks will get some kind of color-treatment around here next week for sure. Oh those gorgeous legs give Bella’s a run for their money! Love toddler legs! we are so going to paint some rocks next week, thank you so much for the idea! collette refuses to wear her own flip flops and now goes all over town in eliots other pair. gotta love that two year old spirit! love those pudgy legs! rock painting is so fun, I even did this with a group of other friends when there wasn’t a kid in sight. Ian always prefers a one color rock- always gold. We have lots of golden rocks around here. Those cute little legs are wonderful! and of course, the painted rocks, ROCK! we used to joke about our mother’s and the way they would say “oh do it how you like, there’s no wrong way…” and then stand over and around fussing about, suggesting easier/better/quicker type do-overs. we hoped we wouldn’t be like that. Rock painting – now there’s an idea. Never did that as a kid. Painted plenty of other things (like my one and only Barbie – only Barbie because I painted the one I had!!) though. 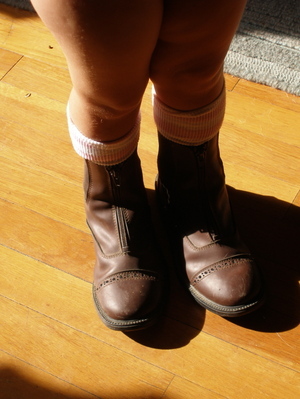 Those chubby little legs in those too-big boots are adorable! Great plan to let things flow with the art. You’re right, the process is the important thing. I need to remind myself of that too. xo. Hello sweet Molly ! I tried to send you mails… Did you received them ? I have your new address mail but I didn’t receive news from you… I’m waiting for your news 🙂 Smooches !